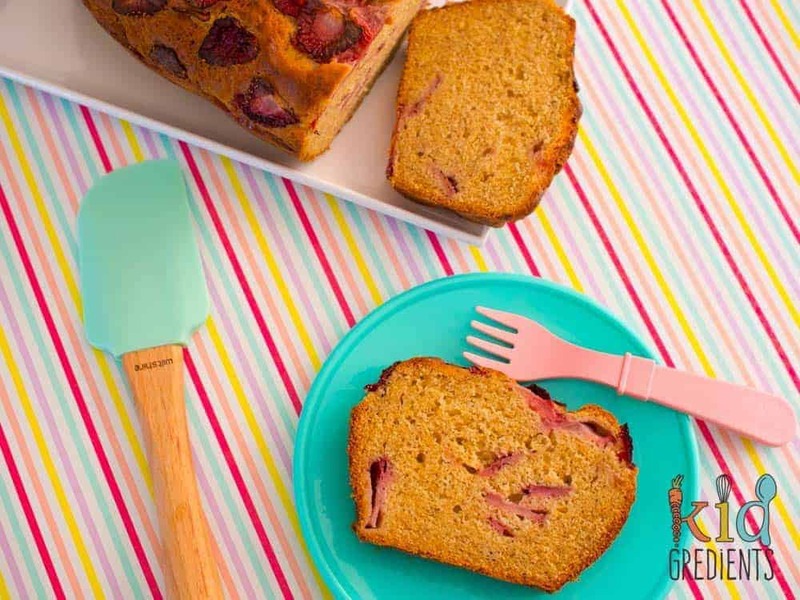 This is low sugar banana and strawberry bread, and it’s really yummy! When I say low sugar, I’m talking 2 tablespoons of added sugar. Divide that amongst 14 slices and you’ve got very little sugar in each slice. Now, we’ve just gotten back from a week at the snow, and I have to admit, despite being awesome at the pre-holiday organisation, I rarely think beyond the holiday…and today we are back at school. 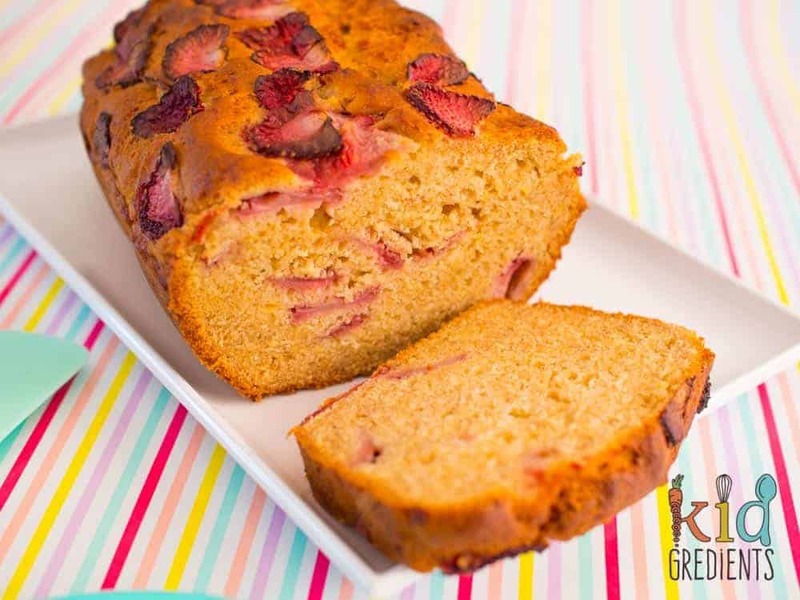 So this low sugar banana and strawberry bread was quickly baked to make sure there was something for lunchboxes tomorrow. Low in sugar, but not in taste! We bought some bananas before we went away and I was particularly disappointed with their quality, but baked they are fine. I tucked them in the freezer before we went so they didn’t disintegrate while we were gone and I quickly defrosted them in the microwave before using them in this banana bread. 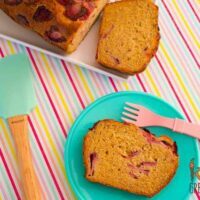 What is it about banana bread? There are so many versions! 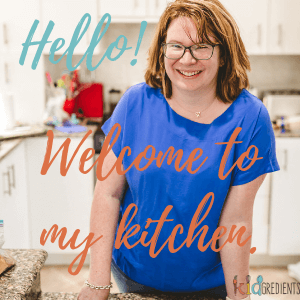 I have a quite high sugar one on the blog that everyone loves (maybe it’s the sugar?). 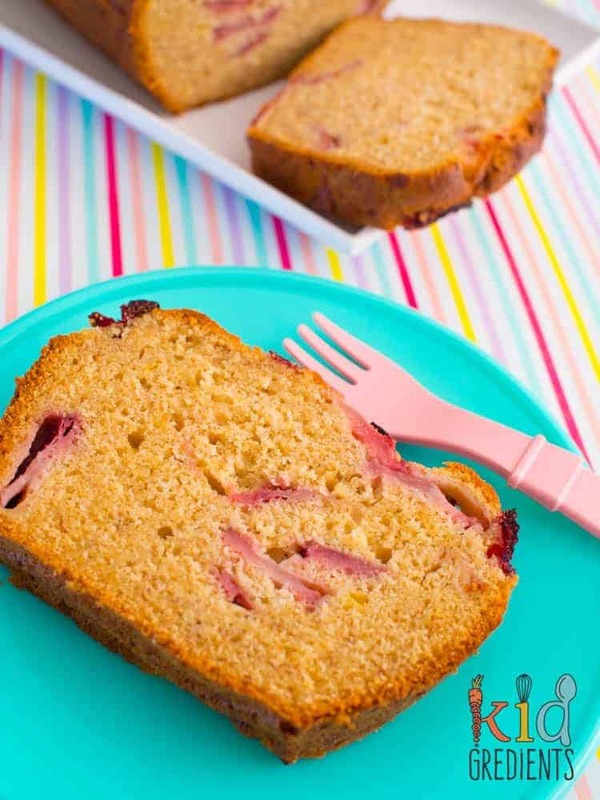 But one of the best things for me about banana bread is how well it freezes, those slices are perfect for popping into the freezer and removing in the morning to be put in the lunchbox quickly and easily. The strawberries on top make it look super special! I’ve said it makes 14 slices, and it does, but for the lunchbox I halve each slice so that it is even smaller, mainly due to size constraints, but also because I like it to go further! But feel free to slice it how you like. You can even toast it! 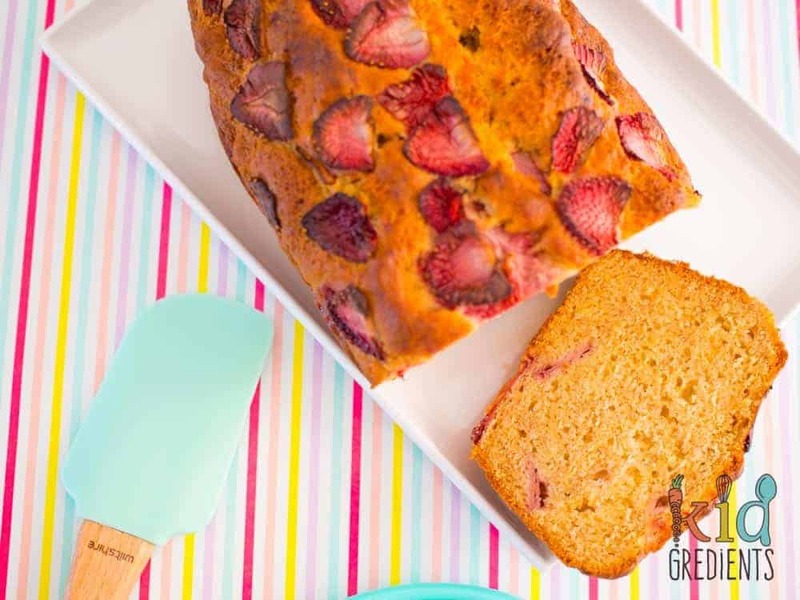 If fresh strawberries aren’t in season for you (bless Queensland and its gorgeous strawberries in winter!) then you could use frozen ones, but I wouldn’t top the loaf with them as they tend to be a lot moister. 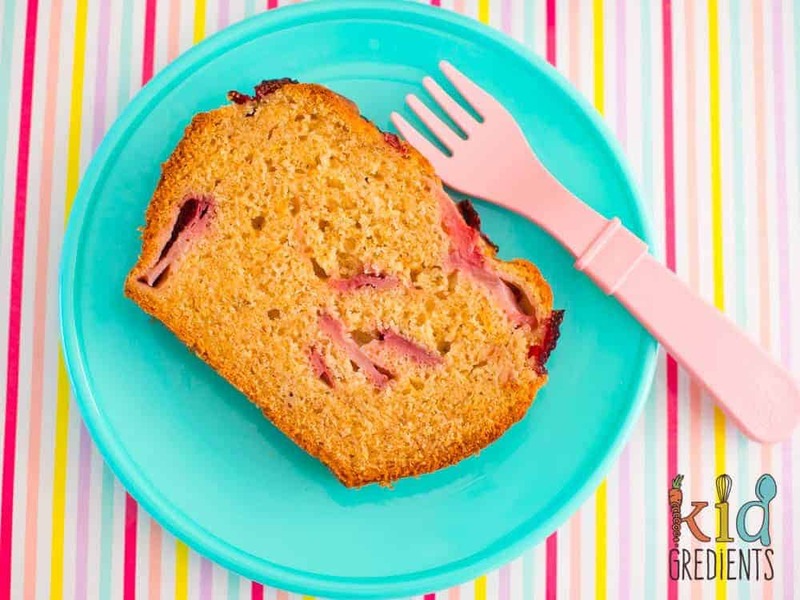 Low sugar banana and strawberry bread, perfect for the lunchbox and freezable in slices. Combine the mushy bananas, egg, coconut oil and vanilla paste in a mixing bowl. Add the flour and coconut sugar. Add 1/2 of the sliced strawberries. Put the mix into a loaf pan (I used a silicone one). Top with the remaining sliced strawberries. Bake at 180 degrees celsius (355f) for 45 minutes. Cool in the loaf pan for 5 minutes before removing to a wire rack.